A Celebration of Harry Potter 2017: Day 2! Celebration of Harry Potter, Davis, Events, Fan Events, Fantastic Beasts Movie, Felton, Harry Potter and the Cursed Child, Honors/Awards, HP Cast, Isaacs, Lewis, MinaLima, Movie Art, News, Pottermore, Studio Tour, Theme Park, Warner Bros.
Day two of A Celebration of Harry Potter at Universal Orlando kicked off early, and after such a brilliant opening ceremony, guests were excited for more Potter-related fun! Matthew Lewis, Warwick Davis, Jason Isaacs and Tom Felton are at the event, along with graphic designers MinaLima, the Cursed Child and Fantastic Beasts teams, Warner Bros. Studio Tour, Scholastic, Lego Dimensions, Harry Potter Expo and many more partners who will treat guests to exclusive panels and access to props, art, testers, talks, meet and greets and more. Universal hosted giveaways throughout the day, telling fans to be the first to find their location within 15 minutes to win a house scarf and an interactive wand. There have been several winners, and the competitions are happening all weekend, so if you’re at the event be sure to visit the @UniversalORL Twitter here. Universal also surprised fans mid-afternoon with a house robe giveaway. The first fan to arrive at 12 Grimmauld Place won the day. Not a Ravenclaw? No problem! Universal also offered a Hufflepuff robe to the guest who made it to the right place at the right time. For the love of Newt, try not to be jealous, but that’s one ‘fantastic’ robing ceremony. If you missed out on those two contests, don’t despair, Potter fans. 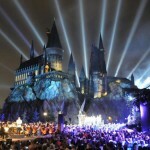 Universal is determined to make this a special once-in-a-lifetime event for all of you with ongoing opportunities. Here’s another–tweet a photo and you might be included in an amazing photo masterpiece! Fans at home can also participate by showing their house pride. Tweet your support, Potter-heads! Paul Harris – Wand Combat Choreographer on the Harry Potter films – gave a masterclass on stage. As you can see, there were many guests who needed to brush up on their wand work! Creature Effects Supervisor Nick Dudman has brought some of his team to #HPCelebration! Visit us in Soundstage 33. MinaLima have also been busy at the event, wearing brilliant matching t-shirts explaining which of them is Mina / Lima. We hope you all enjoyed their panel and meet & greet today! After that, head over to soundstage 21, where there’s much more to experience. See the Lego Dimensions display, as well as props from the films. The Fan Mosaic is also housed on soundstage 21, and it’s a sight to behold. Here’s an updated photo. Fans continued to take part in cosplay today as well, dressed as their favorite characters from the films. Here are a few of the ones we spotted! In addition to all the wizards and witches you may meet milling about the park, don’t be surprised if you come upon some amazing fan art. Or discover one of the many meticulously-recreated details that bring the films to the street, literally. Make sure you walk into every nook and cranny for hidden nuggets like this. A few very lucky fans also came across one of the guests of honor–none other than Tom Felton himself–while embarking on their day’s adventure. He sweetly entreated the little girl not to be afraid, as he is far more friendly than his on-screen persona, Draco Malfoy. 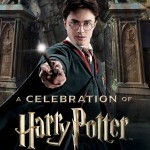 They also participated in a panel from 1 to 2 p.m., and Harry Potter Film tweeted quotes from the event. In case you missed it, here’s footage from the Q&A session with the talent! If you thought fans would head home early after all this excitement, you’d be underestimating Potter fans! Day two closed with a fantastic evening program for guests still in the park, and it was absolutely worth the wait. Next, guests were treated to a video from Warner Bros. offering a sneak peak at the new HP LEGO Dimensions game, where fans can now play as Hermione Granger. Celebration participants can play the game as the most talented witch of our age in the Expo, but this version won’t be able to the public until March. WB Home Entertainment then previewed the Blu-Ray of Fantastic Beasts, which is also available in March, as reported by Leaky yesterday. It includes cast interviews, behind-the-scenes features, a look at the special effects, and scenes that were cut from the movie. They also discussed their favorite scenes from the films and their feelings about doing stunts. Lewis and Felton were also asked what they gained from the film experience as child actors, and all the panelists were very complimentary of Daniel Radciliffe, saying he was kind, helpful, and motivating. Near the end of the discussion, they all talked about their favorite fan experiences. Isaacs said he often comes into contact with Potter fans who say these stories have saved their lives. That, unlike his other work, these stories do much more than entertain–they touch people and make them feel less alone. Lewis then shared the story of a young woman who tattooed her name on his arm because, when she felt life no longer worth living, Neville gave her hope that she had more potential than she knew! Before the evening concluded, the four actors discussed their current projects. Davis said his was top secret. (Star Wars?!) Lewis said he was simply happy to be at Celebration of Harry Potter. Isaacs is currently in the Netflix series, “The OA,” and has four films coming out in 2017. And Felton thanked Potter fans for being so supportive of his crossover to television in The Flash. Watch the evening tribute here. We hope all of you who are lucky enough to be at the event enjoyed the second day. You can read a summary of day one’s events here. And here is the schedule for day three!